Mugabe forced to step down, what would be the fate of Ethiopian Dictator Mengistu living under his shadow? The speaker of Parliament of Zimbabwe read out a letter in which Mr. Mugabe said he was stepping down “with immediate effect” for “the welfare of the people of Zimbabwe and the need for a peaceful transfer of power.” Robert Mugabe, who has ruled Zimbabwe since independence in 1980 for 37 years with an iron fist. Ethiopia’s former Dictator Mengistu Haile Mariam, sentenced to death by his country’s supreme court, had been in Zimbabwe under the protection of ex-President Robert Mugabe’s government since 1991. Since there had been no formal request regarding Mengistu from the Ethiopian government for his repatriation, Should he be deported or will he continue as has lived a life of comfortable exile in Zimbabwe protected by the new coming President Zanu PF against the wishes of Ethiopian people? 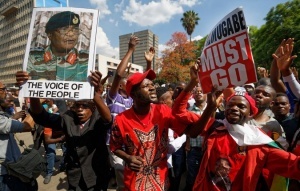 The opposition Movement for Democratic Change, whose leader Morgan Tsvangirai said in the past “dictators like Mengistu was not welcome” will he push his deportation to Ethiopia or to ICC? Mengistu had gunned down along with 60 other members of the Ethiopian royal family, ministers, and generals of the late Emperor Haile Selassie and buried in a mass grave. And later killed the Emperor and buried him under his palace. In his Red Terror of 1980’s massacred over 80’000 innocent students.